Are the Tories Falling or Labour Rising? In this General Election campaign, the media seem obsessed with the gap between Labour and the Conservatives in the polls. 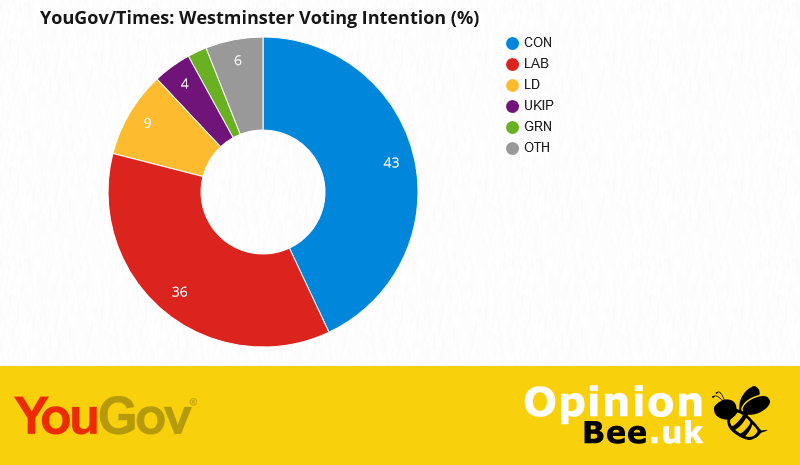 Shortly after the election was called the Tories were riding high with leads over Labour of more than 20 points, and even hitting 50% vote share in one ComRes poll; breaking records was a regular occurrence. But now, after a successful Labour manifesto launch and a not so successful Conservative one, some polls have put that lead into single figures. Whilst undoubtedly the Conservatives haven't helped their position with recent events, the narrowing gap is less to do with any drop in support for them, and much more to do with a surge in support for Labour. 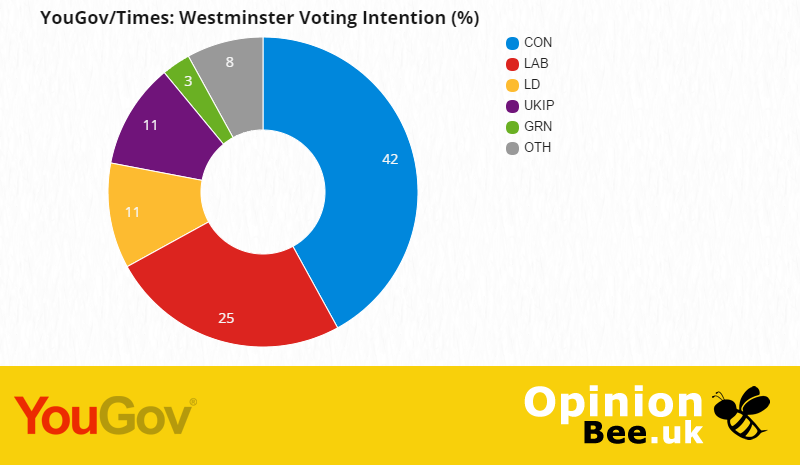 A cursory look at the polling from just before Easter - probably the best set of polling where any movement wouldn't be put down to the election effect - shows a consistent lead for the Conservatives of 17 or 18 points; with them around 43% and Labour on 25%. Compare that to now and you'll note that the Tories are about the same level, or even slightly higher, than at Easter. Labour, however, have shot up 9 or 10 points in the same period. The underlying metrics for Corbyn have improved, but perhaps not enough to explain his party's progress. With the election focusing the mind of voters, there are some interesting movements between the parties which haven't really been picked up on. There is an assumption that 2015 UKIP voters are moving wholesale to the Conservatives and in the initial period after the election was called, this may well have been the case - however, we forget that former Labour supporters also lent their votes to UKIP; and in the continuing collapse of the UKIP polling, some of those will have also gone back to Labour. Second is the almost complete collapse of the Green vote; standing at 4 or 5% at Easter, now down to 2 or even 1% in some polls. If this hasn't gone to Labour almost in its entirety, then I'd by very surprised. The Lib Dem vote has also been squeezed; and yes, there will have been switching from the Conservatives to Labour that will have been compensated by UKIP switchers to the Tories - but frankly not that many. Let us remember that the Conservatives, after seven years in power, are still heading for an unprecedented election victory and a higher share of the vote than both 2010 and 2015. The campaign that they've run has left a lot to be desired, but yet they've not lost any long term support. The dominance of the two big parties has been telling during this campaign. With the voting system that we have, the choices that people make in their constituencies will be a big factor on the result - or more likely the size of Mrs May's majority. You will see marginal constituencies refusing the budge, while safer seats change hands. What is very noticeable in the surge of Labour support is how much it is reliant on the under 25s, and those that didn't vote in 2015. I think we've seen in the Labour leadership elections that Corbyn has the ability to draw in these groups of people, and undoubtedly these votes will be crucial for Labour come 8th June. Pollsters obviously already weight their responses based on predicted turnout of age groups and voting record, however we saw before the EU referendum that the Remain vote was softer than the Leave vote, and differential turnout was a factor of why Leave won. This makes Labour's task even harder than it looks. Even if they can get the young to turn out in big numbers, will that be in constituencies where it matters? It seems that mid-30s will be a tough ask, and even that vote share may not be enough to stop Labour losing seats. We will only find out in time, but the Conservatives are still in a very strong position by historical standards. It could be that the second time in a row that the opposition party has increased its vote share, but lost seats in the election. Corbyn's supporters may point to the former, but the country will only see the latter.